All new software and software updates from Apple are dished out to users through the App Store, and when the software to be downloaded is heavy, it can be a pain in the neck going through the usual process. The situation gets even worse if you are managing multiple Macs and you have to install the software individually on each of them. You can solve this problem by making a bootable external hard drive for the purpose of installing the Mac Operating System (or any other software of your choice) on your Mac. The next Mac OS to be released is Sierra, and there is currently a public beta version of the upcoming software that you can install to your Mac PC. 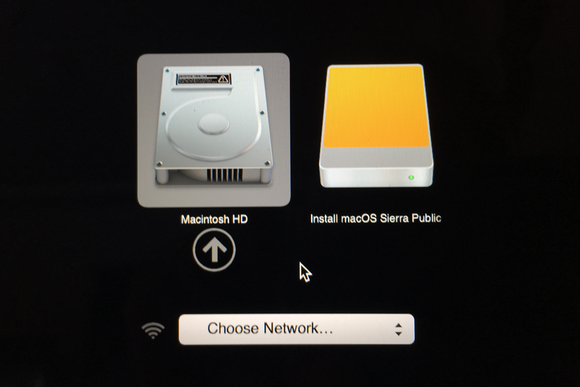 So in this guide, I am going to show you how to make a bootable installer drive for the macOS Sierra public beta that's currently available, and we'll update the tutorial when the final version is released. If you need to create bootable drives for other software, shoot us a comment and we'll look into creating a tutorial for that. Before you can download the Sierra beta installer, you have to be eligible to download the Sierra beta software itself. To do this, sign up for the Apple Beta Software Program, go to the Mac App Store, and download the installer. After downloading the installer, it can be located in the Applications folder on your Mac. If you've downloaded the installer and installed the Sierra beta, you will notice that the installer can't be located again in the Applications folder. It is an automated process that deletes the installer after the software has been installed. Because the installer is needed to create the bootable drive, you have to download it again. You can do this by opening the App Store on your Mac and clicking on the Purchased tab. Here the beta installer is included in the list of apps you've purchased. Click on Download and the installer will be downloaded once again to the Applications folder. To preventing the installer from being deleted again, quit it if it launches itself after the download is complete. Get the external drive you are going to use to create the bootable drive installer. A hard drive as well as a USB Flash drive can be used. The beta installer takes around 5GB of storage, so you may want to make sure the drive you are using has that amount of free capacity. The last step in preparing the drive is to change the name to Untitled. Also note that the storage drive you use will be formatted during the process, so try to copy important files to another storage location. The tool used in this tutorial is Terminal. If you don't want to use it, you can use Install Disk Creator. It is just as good as Terminal. It can be gotten here. Connect the external drive to your PC. It is important that you rename the drive to Untitled or you could get confused in this tutorial. The name can be changed after creating the bootable installer drive. 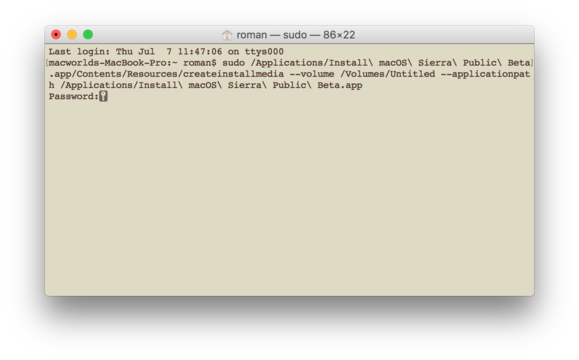 Copy this command >> sudo /Applications/Install\ macOS\ Sierra\ Public\ Beta.app/Contents/ Resources/createinstallmedia -- volume /Volumes/Untitled -- applicationpath /Applications/ Install\ macOS\ Sierra\ Public\ Beta.app and paste it into the command prompt in Terminal. At this point, you will be required to enter a password, which is your user password. Type it in and click on Return. You will be notified by the app that the drive will be erased. Type Y to confirm and click on Return to continue. Terminal will start to erase the connected drive. When the process is complete, you will be asked if you want to use the drive for Time Machine. Click Don't Use. 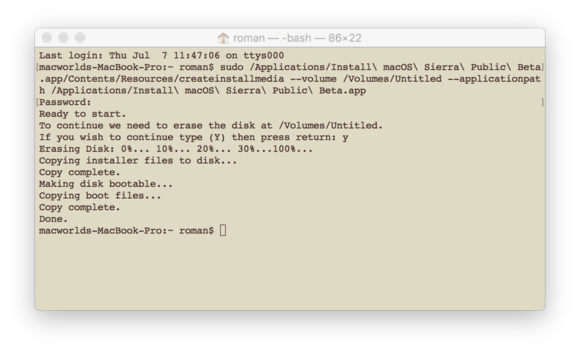 Terminal will now start copying the beta installer to the drive. Allow the process to complete. When it's complete, you will see a Copy complete and Done notice. You can now exit the Terminal app. You have just created a bootable macOS Sierra Installer drive. 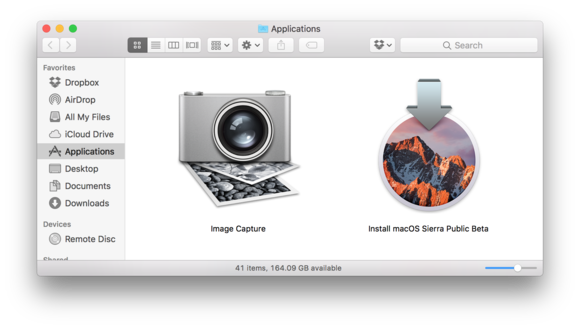 Now that you have created the bootable drive, you may want to use it to install the Sierra beta software on other Macs. Follow these steps to do that. 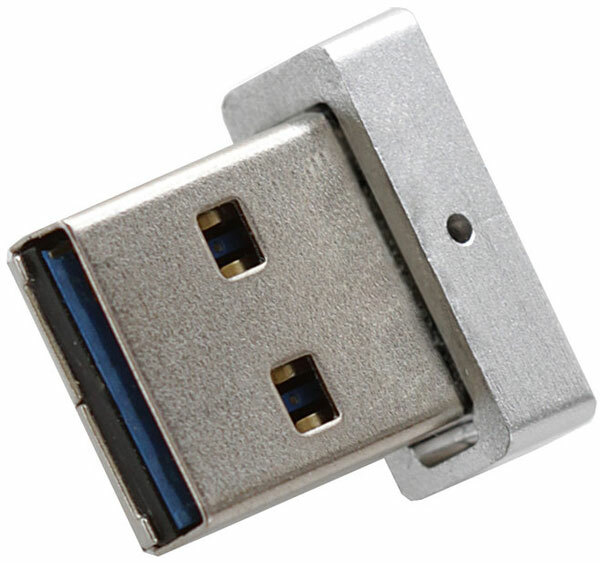 Connect the drive to your Mac. If the Mac is off, power it on. If it's on, restart it. While it boots, press and hold the Option key on the keyboard. Instead of booting straight to your default home screen, the Mac will display the Startup Manager which shows the boot drives available for the system. Click on the bootable drive you just created and click Return. Ignore the Choose Network parameter. The OS X Utilities window will be displayed. If you want to keep your data from the existing OS while installing the Sierra beta, select Install OS X. 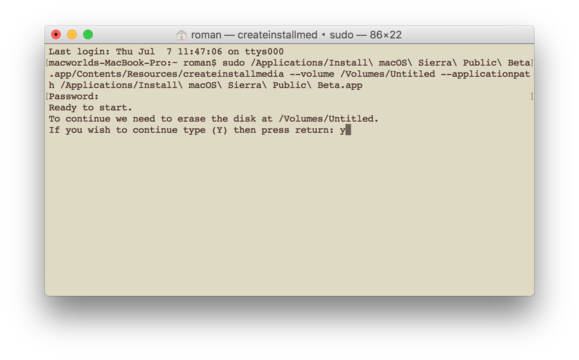 If you don't want to keep your old data, head over to Disk Utility and format the internal hard drive, before selecting Install OS X.
Congratulations. You have just installed macOS Sierra beta using a bootable installer drive.